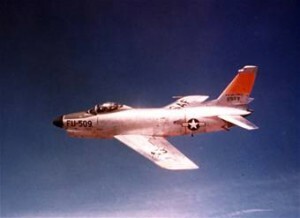 On August 16, 1963, four Massachusetts Air National Guard F-86 Sabre jets were engaged in target practice about 60 miles southeast of Nantucket, taking turns making live firing runs at a 30 by 6 foot canvas target being towed behind a fifth aircraft. The aircraft were all part of the 104th Tactical Fighter Group. At one point a section of the target was shot away, and it struck the wing of an F-86 piloted by Captain Hugh Lavallee, 29, of Springfield, Massachusetts. Lavalle’s aircraft suddenly became uncontrollable, and he was forced to eject while at 20,000 feet over the water. After his parachute deployed, he dropped safely to the water, landing about 3/4 of a mile away from the Russian fishing trawler, Johannes Ware. Captain Lavallee was rescued by the trawler, and once aboard was treated well, handed dry clothing, and given medical attention. A Coast Guard helicopter from Falmouth, Massachusetts, arrived awhile later and brought Capt. Lavallee to Otis Air Force Base. Keeping in mind that this incident occurred while the Soviet Union and the United States were involved in what was known as “The Cold War”, the incident received a lot of positive press, and was even featured in the September 13, 1963 edition of Life Magazine. Unfortunately, Captain Lavalle was killed a few weeks later on November 16, 1963, while flying another F-86 over the Adirondack Mountains in upstate New York. 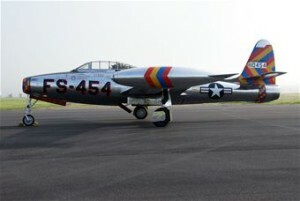 On that date, he and another F-86 pilot were on a navigational training flight, and Capt. Lavallee was last seen entering a cloud bank before all contact with him was lost. The wreckage of his aircraft was found two days later, in a rural area about eight miles from the town of Stony Creek.